"Think of it as a Texas version of Hillbilly Elegy." In 1892, Bryan Mealer’s great-grandfather leaves the Georgia mountains and heads west into Texas, looking for wealth and adventure in the raw and open country. But his luck soon runs out. Beset by drought, the family loses their farm just as the dead pastures around them give way to one of the biggest oil booms in American history. They eventually settle in the small town of Big Spring, where fast fortunes are being made from its own reserves of oil. For the next two generations, the Mealers live on the margins of poverty, laboring in the cotton fields and on the drilling rigs that sprout along the flatland, weathering dust and wind, booms and busts, and tragedies that scatter them like tumbleweed. After embracing Pentecostalism during the Great Depression, they rely heavily on their faith to steel them against hardship and despair. But for young Bobby Mealer, the author’s father, religion is only an agent for rebellion. Twenty-six, and with a wife and three kids, Bobby had left his hometown to seek a life removed from the blowing dust and oil fields, and to find spiritual peace. But now Big Spring’s streets are flooded again with roughnecks, money, and sin. Boom chasers pour in from the busted factory towns in the north. Drilling rigs rise like timber along the pastures, and poor men become millionaires overnight. Grady Cunningham, Bobby's friend, is one of the newly-minted kings of Big Spring. Loud and flamboyant, with a penchant for floor-length fur coats, Grady pulls Bobby and his young wife into his glamorous orbit. While drilling wells for Grady's oil company, they fly around on private jets and embrace the honky-tonk high life of Texas oilmen. But beneath the Rolexes and Rolls Royce cars is a reality as dark as the crude itself. As Bobby soon discovers, his return to Big Spring is a backslider’s journey into a spiritual wilderness, and one that could cost him his life. A masterwork of memoir and narrative history, The Kings of Big Spring is an indelible portrait of fortune and ruin as big as Texas itself. And in telling the story of four generations of his family, Mealer also tells the story of America came to be. Bryan Mealer is the author of Muck City and the New York Times bestseller The Boy Who Harnessed the Wind – written with William Kamkwamba – which has been translated into more than a dozen languages and is the basis of a major motion picture. He’s also the author of All Things Must Fight to Live, which chronicled his time covering the war in the Democratic Republic of Congo for the Associated Press and Harper’s. His other work has appeared in Texas Monthly, Esquire, the Guardian, and the New York Times. Mealer and his family live in Austin. "The Kings of Big Spring tears like a flaming roller-coaster through four generations of a Texas family that's lived it all, from hardscrabble farms and tarpaper shacks to the crazy-making highs of oil booms and big money, with gobs of love, lust, heartache, and Jesus along the way. Bryan Mealer has given us a brilliant, and brilliantly entertaining, portrayal of family, and a bursting-at-the-seams chunk of America in the bargain." "Mealer has pulled off something downright remarkable here. On one level, he has penned a sweeping multigenerational family chronicle that can be read as a history of Texas and, by natural extension, of the American experience. But it's more than even that. In the small twists of fate and nature that buffet the extended Lewis-Mealer clan are reminders of the profound capriciousness of life, of how something as simple as a rain that doesn't come - or a weevil that does - can alter a family's fortunes forever. Masterful and deeply thought-provoking." 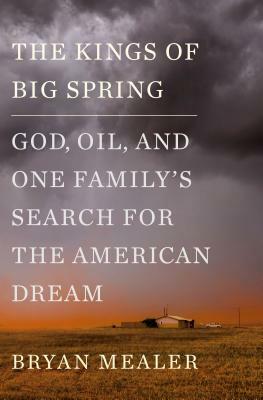 "In The Kings of Big Spring Bryan Mealer has written a mutigenerational saga as broad as the Texas landscape that forms its backdrop. With poignancy and warmth, Mealer’s memoir traces his family from Appalachian hollows to the open ranges of the West. During hardscrabble years, they suffer through droughts, depression, and dust bowl years with tenacity, faith, and more than a bit of luck, and when their fortunes rise during the oil boom, their newfound wealth catapults them into a fleeting jet set lifestyle. At once heartbreaking and exhilarating, The Kings of Big Spring brings to life one family's quest for the American Dream with a Texas twist." reminds me of Carl Sandburg, Howard Zinn and John Steinbeck all rolled into one. "While this engrossing memoir is set in Texas for the most part, it is truly an American tale for everyone. From the first Europeans who set out for the New World, families have moved westward (or northward) for economic opportunities. The Mealers are one of these families. This is a wonderful story about a working class family in the 20th century. Highly recommended"
"If everything is bigger in Texas then so too is Texans’ resilience, that ability to muscle through the cycles of boom and bust that seem inherent in the state’s DNA.Bryan Mealer brings the mythical stature of twentieth century Texans to life with this history of four generations of his family. Theirs is a story of poverty and prayer; oil discoveries and ostentation--big personalities who live hard and take whatever fate delivers, with little regard for past misfortune or future uncertainty. Mealer’s fascinating chronicle feels ripped from the pages of a Faulkner novel: colorful folks with ambition and egos as big as the Texas sky who, when the bottom falls out, curse their fate, seek the salve of redemption, and then simply move on."